Bond sits at a club, his date asks him if he’s paying attention but he quiets her to pay attention to the news report on the television. Alexander Thomas, the Secretary Of State, tells the camera that it’s clear that Britain really doesn’t have anything to offer America anymore. Cut to the Imperial War Museum where Bond meets with Felix Leiter, noting that he’s not really sold on Thomas’ style of diplomacy, especially when lines like that are delivered in advance of an official trip. They talk about the upcoming security issues revolving around Thomas’ upcoming visit, Valence hasn’t been cooperating with MI5 and M wants to know off the record if this is how it’s going to be. Felix answers honestly – he doesn’t know. Thomas is an isolationist but he’s not stupid and it’s too soon to say how he’ll be doing things during his time in the position. Two weeks later and Bond is at MI6 headquarters. Moneypenny sends him in to M’s office where he’s told of a delicate time sensitive issue he needs Bond’s help with. M is surrounded by boxes that they’ve received and, until recently, haven’t paid much mind to – after all, they get a lot of weird mail – but this latest arrival is of concern because it seems to focus on Thomas. There are no fingerprints, M assumes it’s a cypher, but wants Bond to look into it… just in case. M sends him off to the remote village the box was sent from with an away package from Q, but no guns. Is this an opportunity to show the Americans how useful their British allies can still be? When M mentions to Bond that they’ve got a likely GPS signal on their man heading towards an old WWII bunker he instructs Bond to get there as quickly as possible but to wait for backup. When he gets there early and sees a man in camo with an older rifle he assumes he’s found his man. He restrains him, only to be attacked by another bigger, much stronger man. Bond wakes up in a bunker surrounded by a team of militants, one of whom has a tattoo on the back of his head. Bond tries to play his patriotism against him, identifying himself as MI6 and asking him to obey orders and stand down, but Marshall assumes MI6 has now been infiltrated by pro EU operatives. They figure there’s backup on the way so they knock Bond out and take him with them. You could say that this thirty nine page one-shot issue is ripped from today’s headlines, what with the story dealing with the rise of isolationist politics in both the United States and the United Kingdom, an inexperienced Secretary Of State working as a mouth piece for an inexperienced administration intent on tearing down the system and all. And I you said that, well, you’d be right. 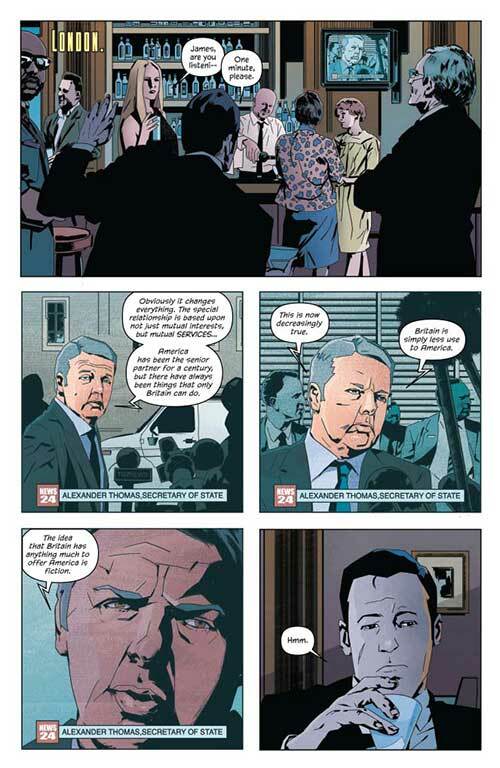 Gillen’s story wears its politics on its sleeve, but that’s never a problem, rather, it grounds the story in the current day, just as it should. Those looking for prolonged character development aren’t going to get it, save that for the longer Bond stories Dynamite has been publishing the last few years, but if you want a solid tale of espionage, action and suspense told with a quick and sharp wit, Service should be right up your alley. Fuso’s artwork is interesting. It’s nicely detailed even if it’s a bit sketchy in style, but it works. Facial expressions, eye movements in particular, go a long way towards helping clue us in to what the characters are up to. Action scenes have nice flow to them, nice movement, and buildings, cars and costuming all looks good. It’s also interesting how the blacks often seem to consume Bond, his trademark black suit really looking more like one solid block of black, just two splashes of white, one on each side of his tie, providing contrast. This story opens with a sequence in which we see Moneypenny in the past, and in the present. 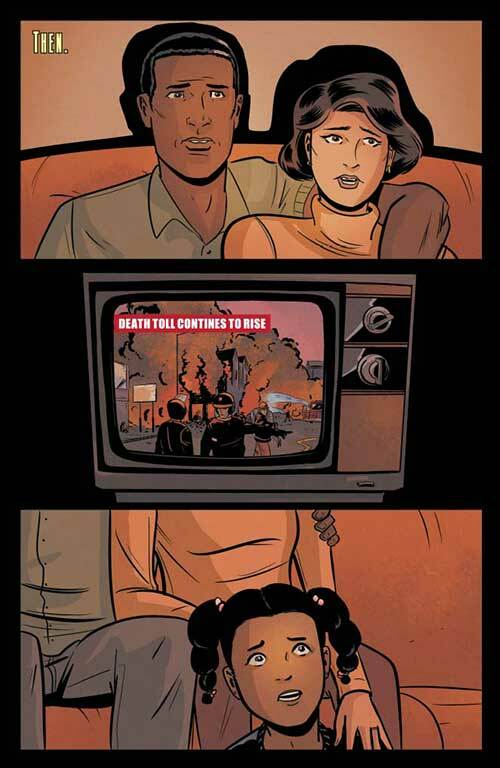 In the past she learns about the harsh realities of the world and learns firsthand what it’s like to experience racism. trains and she gains experience, and is eventually taken out of the field not because her work was poor, quite the contrary – it was because M trusted her. In the present she prepares for a mission accompanying M to Boston and deals with a sexist coworker named Lane who would rather she look pretty than do anything else. The plane lands, they meet up with their contact, Hayes, and have dinner. Afterwards, they retire for the night at an older home where Lane once again chides Moneypenny for taking her work as seriously as she does. The next day M and Hayes address a university class. Everything goes fine until the lecture ends and Moneypenny, ever vigilant, notices that the campus is pretty much entirely empty, even though Hayes notes that classes go on for a few more hours yet. Those expecting 007 himself to play a big part in this self-contained story will be disappointed (though he does have a small cameo) but this does a decent enough job of expanding on the mythos of one of the Bond universe’s most underappreciated characters. 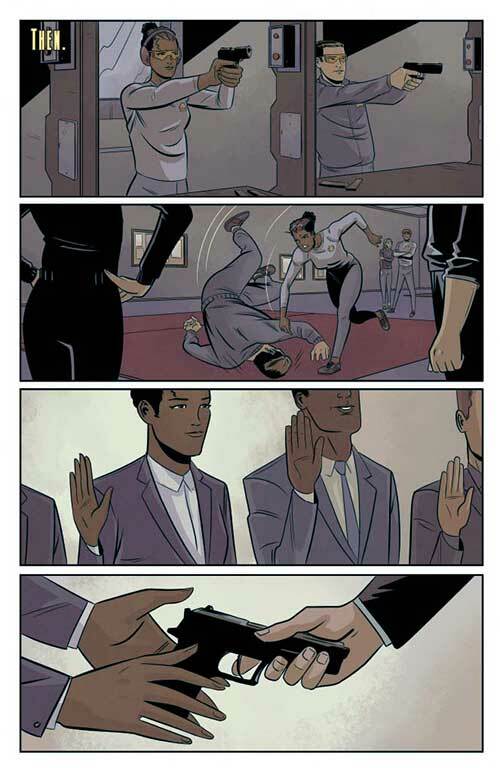 More than just a pretty face sitting behind a desk and more than just a babysitter for MI6, this issue lets us see how and why Moneypenny wound up in the position that she’s won and why she was afforded the job in the first place. It’s not quite a full blown origin story, but Jody Houser’s story gives us enough insight into her past and her upbringing to bring the character into her own. If the story ends a bit more suddenly than maybe it should have, there’s still a lot to like here –good action, interesting character development. 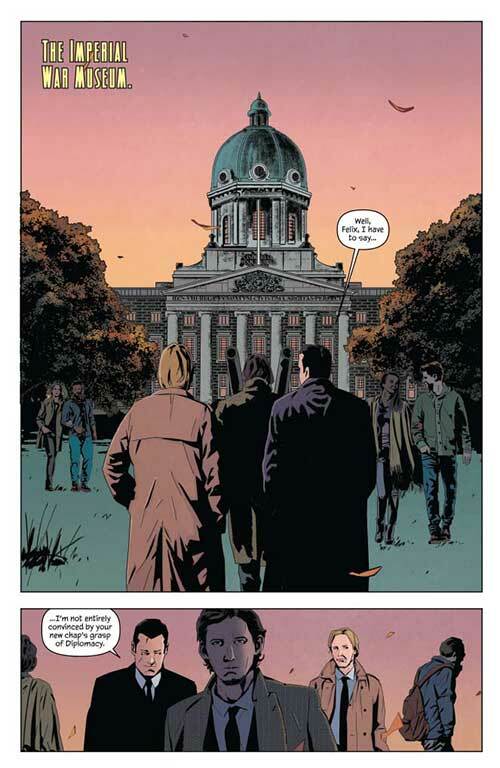 As to the artwork, Jacob Edgar does a fine job here while Dearbhla Kelly’s coloring work suits the look of the story nicely – it’s bright, bold and colorful. There’s a decent amount of detail in the panels and a nice consistent flow to the look of the book. Add to that an appropriately foxy cover piece from Tula Lotay and this proves well worth checking out for anyone who has enjoyed Dynamite’s forays into the Bond universe over the last two years. Bond sits at a club (he does this a lot), his date asks him if he’s paying attention but he quiets her to pay attention to the news report on the television. Alexander Thomas, the Secretary Of State, tells the camera that it’s clear that Britain really doesn’t have anything to offer America anymore. Last but not least, we travel to MI6 headquarters in London where M is essentially interrogating 005 about the wreckage he left in his path when he rescued The Duchess – twenty people dead, thirty injured. 005 is cocky about it and so M kicks him out. Moneypenny comes into the office with a package for him, strangely giftwrapped. He opens it and finds a black bullet shaped object inside. He leaves for the night, is driven to Euston Station, where he catches a train to Belfast, Ireland. The last time he was here he was in the service and the I.R.A. was basically waging war with England. M heads into a bar and asks for Sammy… Mr. Wells. The skinhead at the door isn’t keen on letting him in but M makes his way to the back room where he’s instantly recognized by Wells who sent him the bullet. Why? To get his attention. Wells wants to use M’s contacts to get him the location of some I.R.A. contacts that been missing for some time. Wells doesn’t want their crimes to be forgotten – he wants justice. M doesn’t want to help him, but he owes Wells a debt – flashbacks to their time in the service together explain why. Once this is paid, it’s over and the slate is clean. 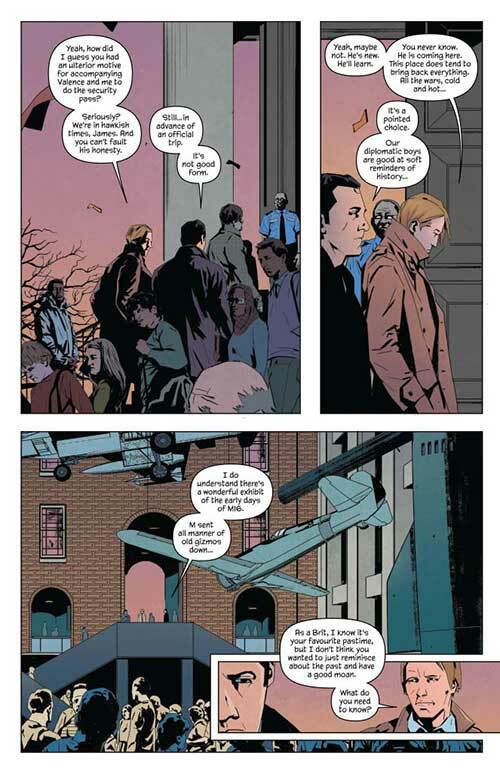 Declan Shalvey’s story is an interesting one, bringing M out of the background and into the forefront, elaborating on his past while keeping him relevant to the present day Bond mythos. The story deals with politics, but never feels overly political, clearly tying into the Irish/English issues that were going on in the eighties that quite understandably still hit home for some people today. The scars run deep, so to say. But first and foremost, this is a story with a good sense of intrigue to it –we know, like M, that Wells isn’t all that he seems but we don’t know why until we get to the last few pages. 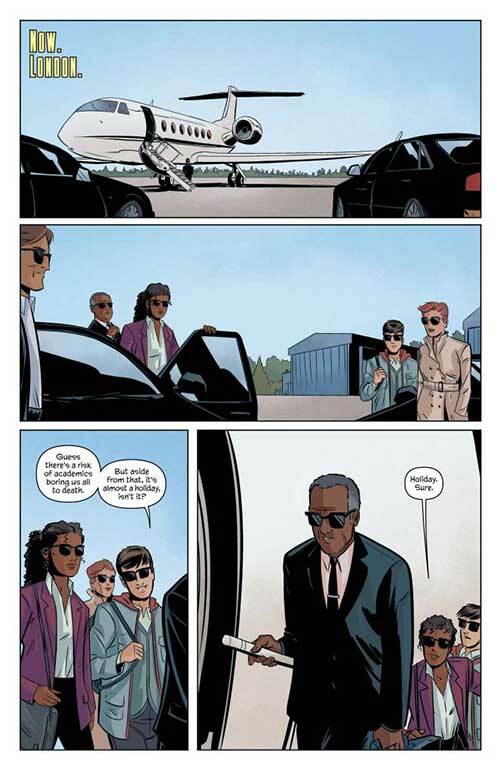 This keeps us interested in this will all play out and makes it a fun read, a comic with the right mix of smarts and entertainment value. PJ Holden’s artwork, colored by Dearbhla Kelly, is quite good. It’s nicely detailed and portrays action well. It’s not hyper-realistic but it’s realistic enough, and it’s not hyper-stylish but it’s stylish enough – there’s balance here, it works well in the context of the story that Shalvey tells. It’s gritty and tough looking, the color compliment this. 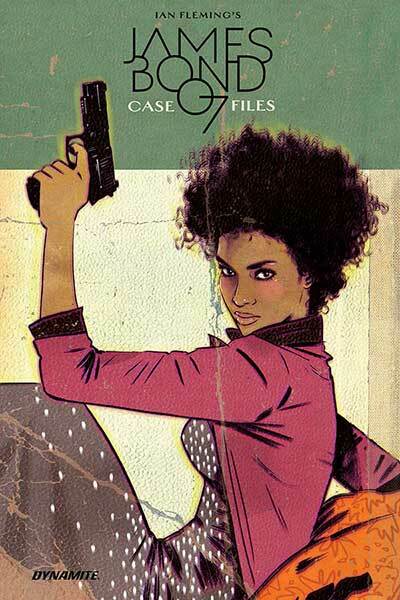 This collection also includes some bonus material in the form of some unused art and sketches from Service, a pinup by Antonio Fuso, some rough layouts from Solstice, some cover pitch images from Solstice, some script pages and layouts from Moneypenny and some commentary over a few M pages from Declan Shalvey.